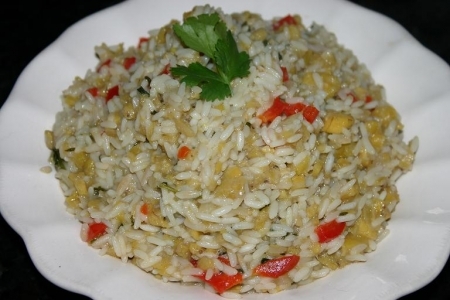 Rice is such versatile dish that can be mixed up many different ways. Typical ingredients from the tropics are featured and is absalutely delicious! Ty pairing this dish with Grilled Porkchops with a Roasted Poblano Pineapple Sauce. Pineapple tidbits can used in place of the plantains, if you can’t find them or mix it up with your favorite tropical ingredients! In a deep large skillet heat olive oil over medium high heat. Add onions and red peppers and sauté until translucent. Add rice and sauté until rice begins to change color. Add plantains and sauté for 2-3 minutes. Add chicken stock, coconut milk, salt and cilantro. Stir and let simmer until all liquid is absorbed.